Facebook has announced that they are adding an AI assistant to their Facebook Messenger app called M and it comes with a range of features. 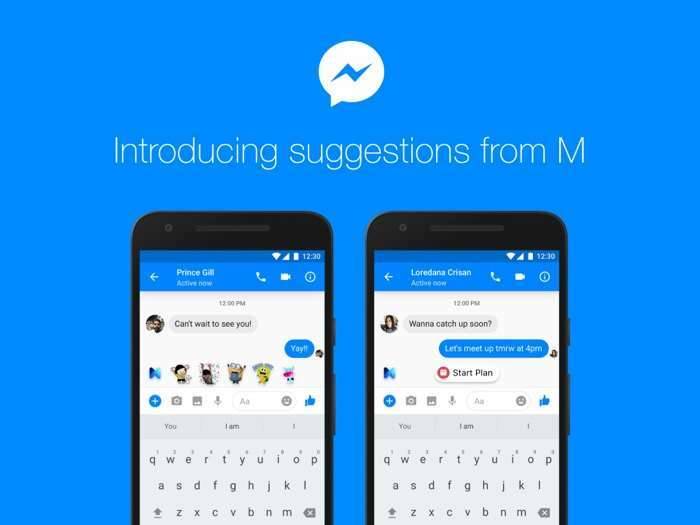 According to Facebook M will offer suggestions based on your conversation, have a look at the video of M below. M relies on AI machine learning techniques. It suggests relevant actions to help manage conversations or help get things done. We are bringing the power of M’s AI technology to support and enhance the Messenger experience and make it more useful, personal and seamless. To experience M, simply chat with a friend or a group as you normally would. M may make a suggestion in a conversation relevant to one of the core actions listed above, and then the M logo and suggestion will appear — it’s that simple. And M learns: the more you use it, the more it can help. You always have the option to ignore or dismiss a suggestion if it’s not helpful, and if you don’t want M’s assistance you can easily mute it in M settings. As suggestions from M start to roll out to users in the US, Messenger users across the globe will also start to see a redesigned way to compose messages. This update offers an easier way to access and discover Messenger features like our rich visual messaging tools and the ability to quickly share content like video and images directly from the text composer with a long press. We’re also adding a “More” tab to more easily access Messenger features such as Games, Payments, Share Location and Rides. Facebook is adding M to iOS and Android in the US and it will also be rolled out to more countries around the world, you can find out more details about it at the link below.